This page provides information on how to access the various help and support features available in IBM SPSS Statistics for Mac. 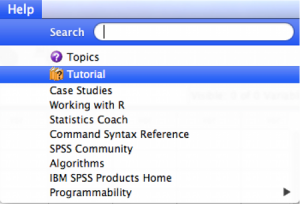 Note: The IBM SPSS Statistics help features may take up to 5 minutes to fully load. Click the Help tab on the top of the screen. The Statistics Coach feature can help you decide which type of analyses to use based on your data and research questions and can help you interpret your results.